Some old enough may remember Gomer from the Andy Griffith show spouting that line. Because I made a mistake – those words are my thoughts. When we travel we often close off the forward head. Any beating of the waves against the boat spurts water into our forward head (cabin) area via the sink. To be safe I also close off the head (toilet) too. If this is too much info skip to the next paragraph. I used the head and without thinking grabbed pump handle. I began pumping the toilet (there is no handle to flush as in home toilets). Pumping required more effort than I expected. On the second pump I remembered; opps, open the seacock. On the second stroke I also heard a little squish. I opened the seacock and completed the task of flushing the head. Sadly I still heard a little “squish”. Some water passing back and forth. The squish ought not to be there. There is a small hole at the bottom of the Henderson / Lavac pump to let any fluids out. I checked and it is a little wet there. Damn! Added to my never ending list is to now replace the head pump. Oh well….. I have another pump all ready made up. We are after all a cruising boat and carry an enormous amount of spares. I have a spare pump, as well as spare rebuild kits. Tomorrow I’ll pull the pump and replace it, then rebuild it in the afternoon at my leisure. After breakfast we begin. While I could do this on my own having a partner assist will reduce the work time considerably. W/ looks up where the spare is, I dig it out of the locker. I check the pump bolts and tighten just a little; after all it has sat in the locker for about 2 years and I don’t want any leaks. We begin by clearing out the lockers on both sides of the pump. In one locker there are a couple of soaked items. Those go in the wash. The rest is strategically placed about the boat to create the biggest mess possible. I now begin to remove the pump. place. This gasket stops water from flowing backwards into the pump. I HATE this design! Three out of four times I have trouble with this part. I tighten up the screws. It still leaks. I get some Butyl out and we put some in the holes and around the screw heads. I tighten down and get a better seal; not perfect, just better. We pump and I’m still getting water around that area. DAMN! I wedge my head in the locker with a headlamp and W/ pumps some more. Double DAMN! 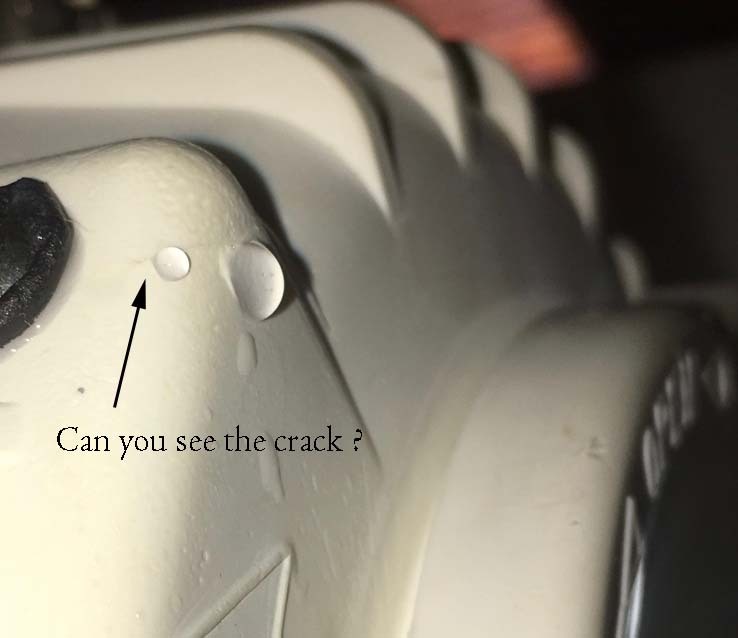 There is a crack in the plastic molding in the pumping chamber. Surprise! Guess what we get to do. 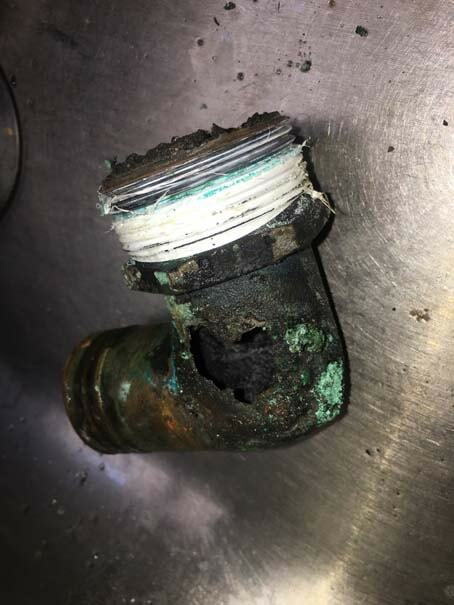 A bronze fitting with a hole eaten in it! Remove the pump, clean the old one, transfer the new rebuild kit to the old pump, put back together and reinstall. An hour or so later we’re ready to put the old rebuilt pump back in service. While I was taking this pump apart W was removing more stuff from the hanging locker where half the pump is. With her eagle eye she sees a drip area that ought not be there and as usual she wants me to be worried too. I check it out. Again I stick my head in the locker with a head lamp and Surprise ! I discover a hole in the bronze elbow where effluent leaves the sewage treatment unit and exits the boat. In many respects this was discovery is lucky. I don’t know exactly when this hole opened all the way up. Had we not noticed and continued to use the system we would have had quite a few items as well as the floor of the locker covered in ground up, fully treated, excrement. A real PITA and real lucky; all at the same time. Even luckier still, I have a plastic 45 degree elbow that I can replace the bronze one with a hole with. I remove the bronze fitting; without breaking anything. I seal the threads on the new elbow with silicone tape and add thread sealant to be sure all goes well. I crawl into the locker and install the new elbow. We also have some new hose we picked up in Whangarei so we decide now is the time to replace that section too. I heat the hose end, install the hose, cut it to length and then install the other end on the seacock. I let the hose cool down prior to adding hose clamps. I remind myself to remember to tighten them before testing the system. I also let W/ know to remind me. We can’t be too careful when it comes to keeping water on the outside of the boat. Back to the pump. I get it installed and the hoses clamped on. W/ adds fresh water to the bowl and we pump. Bingo. No leaks on the pump, a small leak on a joint connecting two hose sections and no leaks at the elbow install. And this time I remembered to check all hose clamps and open the thru hull. I snug down the union and all is right with the world. W/ vacuums out the lockers and then wipes them down removing any salt residue she can. Everything is now cleaned and put back into the lockers. We started this process at roughly 9 am and without any breaks we finished at about 3 pm. All told, in the end, a good day. We discovered a problem after I created a problem. We addressed it, solved it and everything is now ship shape. And what did I learn? Oh…. when we shut down the forward head I will move the pump handle to the aft head. That ought to remind me before I try pumping with a closed seacock again!